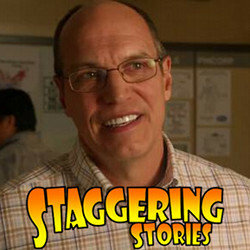 Staggering Stories Podcast » Blog Archive » Staggering Stories Podcast #113: Burn, Baby, Burn! This entry was posted on Sunday, August 21st, 2011 at 11:54 and is filed under Doctor Who, podcast, review, Sci-Fi, staggering stories, Staggering Stories Podcast, Staggering Stories Regular Podcast, Torchwood, tv. You can follow any responses to this entry through the RSS 2.0 feed. You can leave a response, or trackback from your own site. 6 Responses to "Staggering Stories Podcast #113: Burn, Baby, Burn!" hello team, and a big hellooooo to the signed photo of Karen in a special non-sticky, wipe downable cover. No doubt by now you have seen and talked about the new trailer for series 6b, well all of you except the member of the team who has a hissy fit at potential spoilers. When I saw River Song in her eye patch I straight away thought she reminded me of Travis from Blakes 7. So if River Song is going to be the new Travis what about the rest of the crew. Amy could be Servalan. I can just picture her in some of those outfits. Matt could be Villa, and Ar’fer could be Blake as an man who is constantly having his ideals smashed by the utter pointlessness of the world around him. Oh and could die every time he uses the teleporter. On the subject of spoilers, surely the DWM cover was not a spoiler as the Death happened within the first third of the episode. As a rule of thumb for the people who write blurbs, anything that happens within the first third is up for grabs, as an inducement to watch the show/film etc. So all DWM did was follow the usual rules to get people watching by telling them what might happen to get people to watch to find out. In my perfect world that was not a spoiler. Still you can go and have a hissy fit if you want. And Torchwood is getting horribly sad again! Dammit! I know burning the doctor alive served the story but c’mon she was the best character! Oh well, that’s what you get for sending a non-field agent who can’t keep emotions in check. (She would have been fine if she hadn’t attacked the camp director personally like that. He didn’t flip out and shoot until she started to call him “little man”). > “As long as it has aired it is fair game” now, eh? Time for a Bit of Feedback, where i dont have to do much writing. Only Now! Its Time, for A Story! learnt that The Publication was written by a ceratian MISTER M! me copy it into this feedback! July 2010, so theres tons of Articles! But she was a good teacher. is probably impossible. Lots of explanation & exposition but very fun. Alan T Butcher likes this..
MISTER M ; a DWM Tweet has spioled me already. damn them. to be. Hard to say from the clip, though. wider sense of anticipation and suspense. i just couldnt wait for it! feture The 10th Doctor regenerating, i think. picture of the stone Dalek but didn’t really understand what it was. Dodged that bullet too, for the most part! stories like ‘Daleks in Manhattan’. MISTER M Alpha Centuari could marry River. Alpha Song! what iw anted to say! wont mind, Does the psidoe feature the Line Lets kill Hitler? to know, then yes, it features that line very early in the episode! MISTER M thanks! youre to good to me! S Spekaing of which, How was Amys skrit in lets Kill Hitler? P.P.P.P.P.P.P.S Oh Thats not right! P.P.P.P.P.P.P.P.S How was Amys Skirt in Lets Kill Hitler? In 1926 Agatha Christie disappeared. No one has ever been quite sure why she vanished but she re appeared ten days later in a hotel in Harrogate (North Yorkshire). Last Saturday’s Doctor Who put forward a fascinating theory for this strange episode in the life of the world’s most famous crime writer. As you might expect, the episode was full of references to murder mysteries: an English country mansion, a thunderstorm, a jewel thief (called the Unicorn) and a knifing during a blackout. There were even a few clever allusions to the board game Cluedo in Professor Peach, whose death by lead piping in the library started the story off in fine style. It soon became clear that the local vicar (who seemed relatively normal at the start of the story) was not all he seemed. It eventually turned out that he was one of a race of aliens called Vespiform – wasp-like creatures whose hives are located in the Silfrax Galaxy. Giant wasps flew in and out of the story all too often and rather too confusingly for my taste and I will admit to being rather baffled by it all! I’m afraid I never fully grasped exactly how the Vespiform linked to Agatha Christie’s disappearance or how the Unicorn fitted into the grand scheme of things. Of course Doctor Who wouldn’t be the same without its rather convoluted plot lines and,overall, this was an amusing and lively adventure even though I tend to prefer the non alien based Doctor Who adventures ( alien ones are a bit too unsubtle for me). Once again though I was kept happy by the Latin references; the name of this week’s alien, the Vespiform, comes from the Latin word “vespa” meaning wasp. Hurrah for Russell T Davies and his school Latin studies! That’s all from me this month but I look forward to reviewing another Doctor Who episode soon.